Is property the only way to achieve financial freedom? Or are there better ways to be financially successful? There are currently 273 self-made billionaires. Yes, I said billionaires with a B, not an M – billionaires. How many of these billionaires do you think made their fortune in real estate? And today I want to talk about whether or not property is the only way to achieve financial freedom. So is property the only way to achieve financial freedom? And how many of those 273 self-made billionaires made their wealth through real estate? The answer is 17. Only 17 people out of 273 made their fortune through real estate. The highest category was tech – we’re talking Facebook, Twitter, Snapchat, that sort of stuff. But number 2 was real estate with 17 people. So obviously that leaves a lot of other areas where people became billionaires, but for the average Joe, for you and me, is property the only way we can achieve financial freedom or at least achieve it before retirement. And the answer is: the property can be a great way to achieve financial freedom but it’s not the only way. So let’s look firstly how to achieve financial freedom. To achieve financial freedom your goal would be to have more income coming in – passive income that you don’t need to work for, then you have going out in expenses. And through property that can be achieved in couple of ways. That can be achieved through positive income – that means you have positive cash flow properties where the rents are coming in and it’s more than the expenses, so you gain this passive income each and every week. Or it could be through equity growth in which case your properties are going up with value – that can be natural growth according to the market, or you could manufacture that through renovations – but basically your properties are going up in value and you can access that equity or that increased value by borrowing against it or by selling. So there’s two main way of achieving financial freedom – passive income and equity growth. But how can we achieve financial freedom outside of property? With saving money you’re not really getting growth on your money cause even though you might be getting 3% or 4%, inflation is going up by about 3% anyway so you’re kind of just making up for what you’re losing in inflation. But if you make a good deal of money you could save your way to financial freedom. Number 2 is through stocks and this is how the majority of investors in Australia achieve retirement and achieve financial freedom, and that’s mainly through their super funds investing in the stock market. So when you’re investing in the stock market you’re investing in other people’s businesses and obviously if that business is successful you get a share of the profits and your percentage of that company goes up in values because now a more profitable company. So a lot of people will invest in stocks and achieve financial freedom through stock. Way number 3 is through business. Si you could create a business or buy a business and then grow it and improve it and eventually you could exit that business in 2 ways. You could turn it into a business that runs itself, so you got presidents or managers who run the business for you and you just act as an owner, or you could sell that business for a profit. And that is a very successful way to become financially free. If you’ve started Facebook and then sold Facebook today, imagine how much money you would have and you wouldn’t of had to invest in any property at all. Way number 4 is through royalties. This is like things when you write a song, maybe you write a play – you do some creative work and people pay you royalties in order to use that. So when your song is played on the radio or someone buys your song, you get paid royalties for it. But for most of us, we’re not that great artists and that’s why we’re interested in property cause we’re not going to make our money by being famous and so we go after more proven and easier ways to achieve it. But royalties are still a way to achieve financial freedom. Number 5 is through cash flow generators. These are technically bad businesses, but I wanted to separate them out to help you start thinking about them differently. One thing you could do is invest in websites. That’s something that I do whenever I have spare change around because websites, at the moment, they sell for about 20 months income for a decent website. Obviously you need to do your due diligence, you need to know what’s going on, but that means that I can purchase a website, I’ll get my money back in less than 2 years, and then everything on top of that would be cream for me. Obviously the Internet is a very volatile place so you need to know what you’re doing but things like websites or ATM machines that you can buy with companies and you get a percentage of the profit – things like that, little cash flow generators that you look at investing in. And number 6 would be commodity. This is things like silver, gold, oil – these sort of commodities that people want and need, and obviously if you purchase them and they go up in value then that can be very profitable for you and help you achieve financial freedom over time. 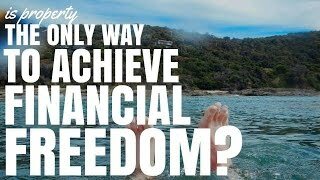 So there you have 6 different ways that you can achieve financial freedom that’s not through property. For me, I still love property and I’m mixing business with property, and so my goal is to build businesses and buy property and that’s how I will achieve financial freedom over time. I did a blog post on my personal blog 5 years ago, well it’s actually about 4 and a half years ago. It was in October 2008 and so I declared on my personal blog that I would be financially free in just 5 years and so I’ve got 6 months left. I don’t like my chances, but you never know what could happen. We’ll see, but as soon as that day hits you can bet that I would be creating a video about that documenting where I’m up to in October 2014.